The Eastern Province Governor Dr. M.L.A.M.Hisbullah flagging off the race at Thoppigala, Batticaloa. 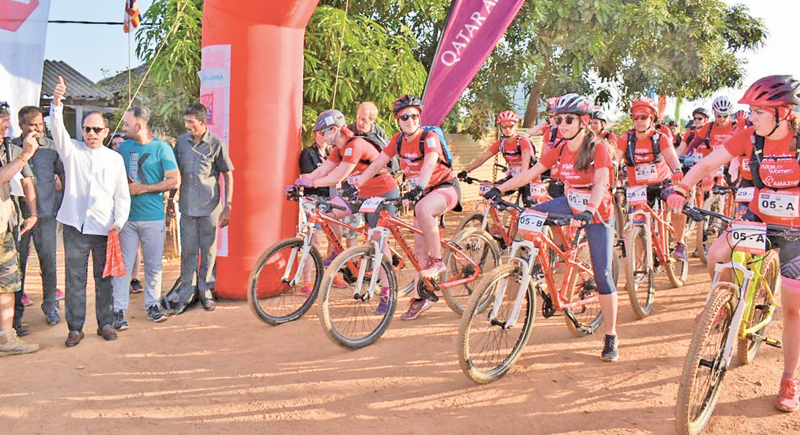 A bicycle race was held at Batticaloa in the Eastern Province attracting foreign tourists from European countries and as a tourism promoting event in the Eastern Province recently. The 47km bicycle race was jointly organized by Batticaloa Kumaisans Group and Pasikkuda Malu Malu Hotel. The prime intention of the event was to promote tourism in the Eastern Province. Around 200 competitors including cyclists from France consisting of doctors, Engineers and Accountants have visited Sri Lanka and stayed for a week in the Eastern Province to participate in various recreational sports at Passikuda and Batticaloa tourists destinations. A cricket tournament was also conducted for tourists at Weber Stadium, Batticaloa. The ultimate aim of having these completions with the participation of foreign tourists is to popularise Eastern Province as a tourist destination and to spread the message of hospitality while allowing tourists to explore the natural beauty in the Eastern Province.